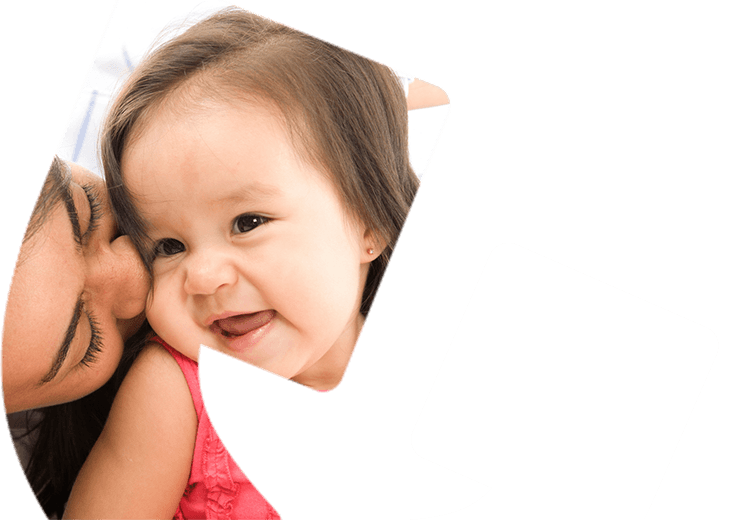 The Early Home Learning Study was successful in enrolling over 2200 families. The study found that parents who attended smalltalk groups improved in a number of areas. 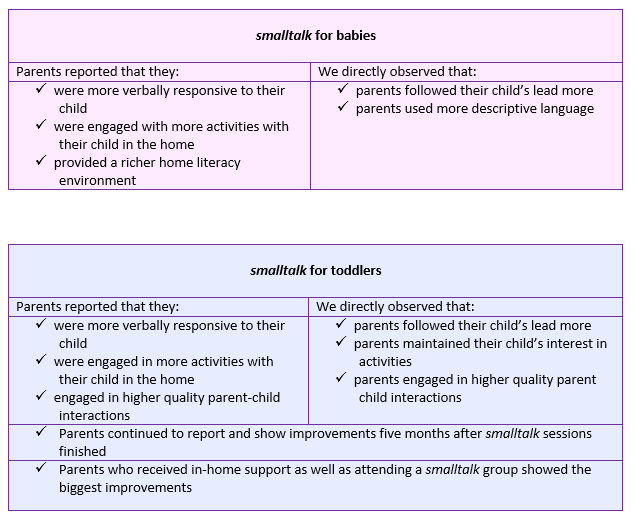 We compared smalltalk groups with ‘standard’ playgroups that did not have any smalltalk content but did have high quality parenting information. These different groups helped us measure how smalltalk benefited families. Below is a summary of the results. Both parent engagement and parent satisfaction with smalltalk was high. Parent engagement in the EHLS was high. Of the 2228 parents who were eligible to participate in the study and completed a pre-assessment, 85% went on to attend groups. Across all three intervention types (standard, smalltalk and smalltalk plus), group attendance was high with parents attending an average of 59% to 64% of available sessions. Very high levels of attendance were also observed for home coaching – with parents from the smalltalk plus condition attending an average of 78% to 81% of available sessions, and 67% receiving all six home coaching sessions. Parent satisfaction with the interventions across all conditions was extremely high, with the majority of parents either ‘satisfied’ or ‘very satisfied’ with the group (95%), their facilitator (97%) and their home coach (98% for those in smalltalk plus), with significantly higher satisfaction levels reported for smalltalk plus. Across all conditions including the standard condition, the majority of facilitators and parents reported that the intervention had a positive effect on parent knowledge, skills, and behaviour. However, they were significantly more likely to report positive impacts for the smalltalk and smalltalk plus conditions than for the standard condition. For further information on the EHLS, you can see further details in a report or you can contact the Parenting Research Centre via email or telephone on 03 8660 3500.